Glenlohane Cottage has been part of the Sharp Bolster family who are celebrating 275 years in Glenlohane House in 2016. It is an exceptional period cottage built in the 1600’s and added onto over the centuries. Centered in the Glenlohane farm estate, this geographic location is one of the very best locations for touring the Scenic Southwest of Ireland. The Wild Atlantic Way, the Burren, Cliffs of Moher, Dingle, Rock of Cashel, Cork City, Blarney, Ring of Kerry, Killarney, Kinsale, Bantry & the Beara, and even Schull are all easy day trips. If you are searching for an exceptional vacation rental steeped in character, history and style, this 2 bedroom, 2 bath property is ideal for you. Besides day trips, the cottage has become a great respite for those who love to walk and guests have access to the 250 acre estate. Also, for salmon and trout fishing, we have our own private ghillie and miles of private fishing on the famous River Blackwater. The town of Kanturk hosts some of the friendliest locals any of our guests meet on their travels and it also has easy shopping, fantastic restaurants and even it’s own castle which is one of the very best you will see anywhere in Ireland, we assure you. This is truly a dream cottage with easy access in any given direction to the Scenic Southwest of Ireland. Cork airport is less than an hour away and Shannon airport is only 1 hour and fifteen minutes and both are great airports. 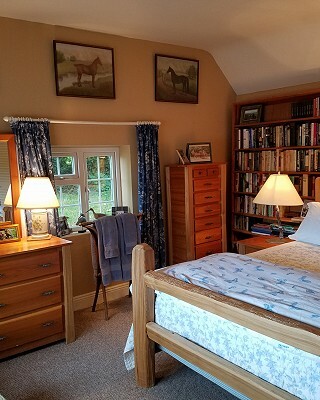 Glenlohane has two bedrooms – each with their own bath. One room has an American Queen-sized bed and the other has two American-sized twin beds. Both rooms have stunning views of an expansive stone patio, lawn and one of Glenlohane’s largest fields. Please note, though, this is an old-fashioned roadside cottage and it is not ideally suited for young children. We have satellite TV, WiFi, a cornucopia of books and DVDs, comfy sofas and a glorious fireplace for evening fires if it gets cool out at night. We also have a BBQ outside for the warmer nights!